According to the definition formulated by Etienne François and Hagen Schulze, memorial spaces or sites of memory are “crystalization points of collective memory and identity which are long-standing and handed down from one generation to the next. They are embedded in social, cultural and political customary practices, and are modified over time through the manner in which they are perceived, appropriated, used and passed on.” They exist “not because of their concrete, material form but because of their symbolic function.”1 This definition can be applied to Dresden’s Heidefriedhof [Heath Cemetery], the graveyard where most of the dead from the bombing of the city in February 1945 are buried. This is the site where the symbolizing of the Dresden’s victim role in the Second World War became manifested architecturally as a crucial element of the collective memory of the city, and where it was and still is ritualized in annual customary practices. So far, however, this space has only experienced appropriation and transference, but not the phenomena of change and adaptation which accompany memorialization culture. The Heidefriedhof is certainly, right up to the present, one of the city’s sites of memory in the minds of its citizens. But in practice its use has never developed beyond its function as a commemoration space, where up to 2014, the ceremony of wreath-laying and so-called “silent commemoration” that was established in GDR times has been held every 13 February. Around 250 representatives of the city, politicians and citizens have taken part along with supporters of the far right-wing NPD and similar organizations.2 The mono-causal, one-dimensional narrative perspective, which focuses exclusively on the victim role of Dresden, does not do justice to the site. Quite the reverse: most of those involved, starting with Saxony’s premier and the mayor of the city, were apparently largely unaware of what historical images they transported with their annual use of the Heidefriedhof in the context of 13 February. The very fact that they held the act of “silent commemoration” every year in the company of old and new National Socialists should have given them pause for thought. In the light of the generation shift,3 it is both desirable, feasible and in fact necessary to call for the modifications contained in the François/Schulze definition. The aim of my article is not merely to describe the status quo but to give a brief outline of the problematic issues involved in precisely this process of modification. Thus I will attempt to show the potential of the Heidefriedhof as a memorial space and to pursue the question of whether educational learning-location approaches, developed in particular in work on sites of memory, could be applied to dealing with received traditions.4 Is it possible to apply to the Heidefriedhof a concept which is intentionally removed from the mere emphasis on the site as an authentic space and which instead aims at transmitting knowledge and reflection, linked to the present? What can be expected of such an undertaking, and within what institutional framework should this take place? Apart from the commemoration ceremony on 13 February the Heidefriedhof, though not entirely ignored, has had a very limited degree of reception in Dresden. From time to time it was not included in the relevant local topographies,5 nor in the activities organized over the last twenty years in connection with the annual acts of remembrance.6 Fear of touching on painful issues, inadequacy and helplessness, and “it’s-better-not-ask-any-questions” may have played a part. It speaks volumes that there is still no wall plaque or anything similar to describe the site and place it in its historical context.7 I will attempt to outline just how important such information is, in view of the many different (hi)stories intertwined with one another in this space. The Heidefriedhof, along with the Frauenkirche,8 was one of the most important memorial sites for the people of Dresden within the context of the annual commemoration of the bombing raids. The ceremony dating from GDR times was simply continued or passed on with almost no alteration.9 Interestingly, the cemetery itself underwent little change after 1989 and was merely partially extended: unlike numerous other monuments and memorials erected in GDR times this unquestionably valuable historical ensemble was not dismantled. Thus this cemetery presents an intact or rather unfiltered view of how history was constructed in the period up to 1989. Originally planned in 1927, the Heidefriedhof was consecrated as the “Waldfriedhof, Junge Heide” [Wood Cemetary] in 1936 along a broad central axis or avenue.10 However, further plans such as the creation of a grove of honour for the dead of the Second World War from 1939 were not realized. Following the air raids on the city in February 1945, mass graves were laid out and a plain wooden cross at the north end of the axis marked the first central commemoration point. Relatives of the dead placed individual crosses and gravestones on what were in fact anonymous mass graves, thereby making the site a focal point for grappling with the traumatic experiences in a personal context.11 Clearly, there was no room for reflection on the relationship of victim and perpetrator. Such reflection was never called for in the Heidefriedhof and thus never became part of the story told by this cemetery, as will become evident. 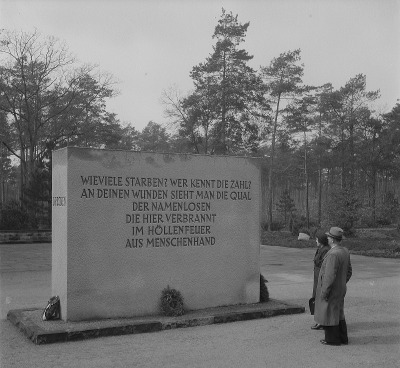 Thus in 1954/55 a permanent “Ehrenhain für die Opfer des Faschismus” [grove of honour for the victims of fascism] was set-up, and in 1965 extended as “Ehrenhain für die Kämpfer gegen Faschismus und die Verfolgten des Naziregimes” [grove of honour for the fighters against fascism and the persecutees of the nazi regime ] to include the mass graves.17 Quite deliberately, victims of National Socialism and victims of the bombing were “commingled”, made one and the same in the Heidefriedhof. The wooden cross was replaced after 1950 by a wall on which the lines of the Dresden poet Max Zimmering (1909-1973),18 buried nearby, were written. Wall with the lines of the Dresden poet Max Zimmering between the mass graves, after 1950. Photo: SLUB Dresden / Deutsche Fotothek / Richard sen. Peter (No. 88954003). They draw on the victim myth of Dresden and can furthermore be seen as part of the debate over the death toll. “Wieviele starben? Wer kennt die Zahl? / An deinen Wunden sieht man die Qual / der Namenlosen, die hier verbrannt / im Höllenfeuer aus Menschenhand.“19 [How many died? Who knows their number? / In your wounds we can see your agony / the nameless who died here / in a hell-fire of man’s making.] Not far from the main avenue a grove of honor had already been laid out in 1954/55, with the idea of “gathering” there the “witnesses” of the early history of the GDR. In keeping with the founding myths of the GDR as an anti-fascist state, this idea was further pursued with the extension of the main avenue in 1965 in front of the mass graves: resistance fighters, deserving communists and Socialist Unity Party (SED) officials were buried or even reburied here, along with figures who were simply adopted and integrated into the narrative of the GDR and just grouped together. Later they were joined by victims from concentration camps and forced labor.20 Koreans and Greeks who died in GDR exile after 1949 were likewise integrated. The last extension was made in 1989 on the outer limits of the cemetery and was dedicated to Soviet prisoners of war who had been forced laborers in Dresden.21 The international dimension that was already part of the instrumentalization of the Dresden bombing, depending on the phase of the Cold War,22 found its expression in an obelisk placed 1965 at the southern end of the main avenue. It bears the symbol of the international federation of resistance fighters (Fédération Internationale des Résistants). In the middle of the main avenue there was also a circular space/plaza or “Rondell” laid out in 1965 against “War and Fascism”, enclosed by 14 sandstone pillars and in the center a 1969 featured fire bowl. This “Rondell” is midway between the memorial space for the “victims of fascism” and the mass graves of the bombing victims. The reference and message of this ceremonial space extends beyond the local setting, and above all it places the destruction of the city in a “larger context”: the pillars bear the names of concentration camps as well as of other cities destroyed in the Second World War.23 The presentation in this space goes beyond the contextualizing of the destruction of Dresden within the anti-fascist founding myth of the GDR, and is a further expression of the victim myth. This can be seen in the placing of the Dresden pillar between those of Leningrad (Ленинград, now Са́нкт-Петербу́рг) and Coventry, in the company of the names Auschwitz and Lidice. Thus National Socialist crimes and the events in the course of the war were not simply brought together but “formally arranged as equivalent”.24 This made it quite impossible to raise any questions about responsibility and involvement.25 What is more, this narrative perspective, together with the lack of contextualization and deconstruction, continues to prevent a critical discussion and appropriation, right up to the present. 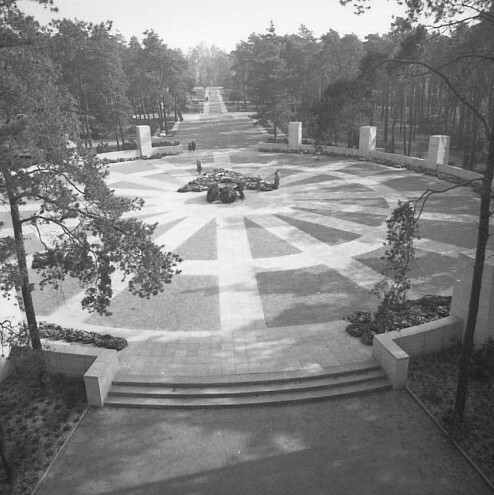 The „Rondell“ in the middle of the axis with 14 sandstone pillars, the fire bowl and the mass graves in the background, after 1970. Photo: SLUB Dresden / Deutsche Fotothek / Erich Höhne & Erich Pohl (No. 70608124). 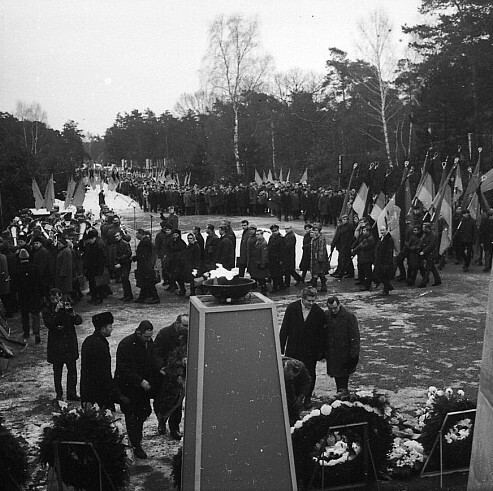 Commemoration of the bombing raids on Dresden: rally at the mass graves on the Heidefriedhof in front of the 2nd version of the wall, February 13, 1970. In the following years the cemetery and his constructed story was not only used in February. Rather, wreaths were laid at the cemetery on various occasions throughout the whole year (e.g. visit of international delegations, national holidays, party congresses). Photo: SLUB Dresden / Deutsche Fotothek / Erich Höhne (No. 70608073). The educational concepts from commemoration site work may perhaps not be directly applicable to the case of the Heidefriedhof, but the impulses mentioned are certainly there. The central elements of memory site education are the connection to a specific location, the recounting of historical events through individual biographies, empathy and the link to current social phenomena such as racism or anti-semitism. What could be problematic is the overly strong concentration on the victims: their biographies are quite rightly in the foreground, but this could have the effect of removing the focus from the perpetrators and the social context.29 And it is precisely in this (mis)relationship that one of the central problems of this site’s historical narrative can be found. Furthermore, the Heidefriedhof is not an authentic space within which the events that are at the heart of the narrative actually took place30 – neither for the dead of the bombing raids, nor those buried and reburied here. At the same time it is well-known, and in the meantime verified by academic research, that cemeteries are learning places.31 The Heidefriedhof, irrespective of its spatial and constructional particularities, does also allow an individual biographical approach to be taken. Citation Swen Steinberg: From Memorial Space to Learning Place. Present and prospective (hi)story telling at the Dresden Heidefriedhof/Heath Cemetery in: Abolish Commemoration – A Critique of the Discourse to the Bombing of Dresden in 1945, online at http://www.abolishcommemoration.org/jerzak.html [accessed dd.mm.yyyy]. 1 Etienne François/Hagen Schulze, „Einleitung“, in: Etienne François/Hagen Schulze (ed. ), Deutsche Erinnerungsorte, Vol I, München: C.H. Beck, 2001, pp. 9-24, here: p. 18. cf. also Henning Fischer, Erinnerung an und für Deutschland. Dresden und der 13. Februar 1945 im Gedächtnis der Berliner Republik, Münster: Westfälisches Dampfboot, 2011, pp. 122-126. 2 cf. ibid., pp. 137-139. 3 cf. Jan Assmann, Das kulturelle Gedächtnis. Schrift, Erinnerung und politische Identität in frühen Hochkulturen, München: C.H. Beck, 1992. 4 cf. For example, the contributions in Bernhard Schoßig (ed. ), Historisch-politische Bildung und Gedenkstättenarbeit als Aufgabe der Jugendarbeit in Bayern. Einrichtungen – Projekte – Konzepte (Dachauer Diskurse. Beiträge zur historisch-politischen Bildung 5), München: Herbert Utz Verlag, 2011. 5 cf. for example Getraude Stahl-Heimann, Dresdner Friedhöfe und ihre Besonderheiten, Heidelberg: Rhein-Neckar-Zeitung, 1996. 6 cf. the art project started in 2001, „Gravuren des Krieges – Mahndepots in Dresden“. In connection with the Heidefriedhof only the Altmarkt is mentioned. Matthias Neutzner/Jens Herrmann/Arend Zwicker (ed. ), Gravuren des Krieges – Mahndepots in Dresden. Ein Kunstprojekt zu Dresdner Erinnerungsorten an Nationalsozialismus, Krieg und Zerstörung, Altenburg: DZA, 2006, pp. 9–10. See also criticism of this form of commemoration which places undue emphasis on the German victims instead of on the victims of the Nazi regime, Fischer, Erinnerung, 2011, pp. 151–152. 7 There is merely a small room in one of the buildings at the main cemetery gateway containing a collection of objects and photographs, referred to as a “permanent exhibition”, on the history of the Heidefriedhof. There is no information text here either so that the visitor has to “guess” on the basis of several historical photos that the site underwent a number of alterations. There is no contextualization or even commentary on the pictures, for example whether a wreath-laying ceremony took place on 13 February or on another occasion. 8 cf. the development in the 1980s as the city centre of Dresden became more important for the annual commemoration, Thomas Fache, „Gegenwartsbewältigungen. Dresdens Gedenken an die alliierten Luftangriffe vor und nach 1989“, in: Jörg Arnold/Dietmar Süß/Malte Thießen (ed. ), Luftkrieg. Erinnerungen in Deutschland und Europa (Beiträge zur Geschichte des 20. Jahrhunderts), Göttingen: Wallstein, 2009, pp. 221–238, here: p. 225–229, see also the role of the Frauenkirche and its reconstruction Fischer: Erinnerung, 2011, pp. 134–145. 9 cf. Fache, „Gegenwartsbewältigungen“, 2009; Fischer, Erinnerung, 2011, pp. 122–158. 10 cf. Marion Stein, Friedhöfe in Dresden, Dresden: Verlag der Kunst, 2000, p. 145. Cf. also for the following details Landeshauptstadt Dresden (ed. ), Erinnerungsort Heidefriedhof, Dresden 2014, including a map on page 2. 11 cf. the photographs taken on the fifth anniversary of the bombing in 1950 in the Bundesarchiv Berlin, Bildarchiv, 183-S93765; op cit., 183-S93767; op cit. 183-S93769. 12 cf. Fischer, Erinnerung, 2011, p. 132; Fache, „Gegenwartsbewältigungen“, 2009, pp. 222–224. 13 cf. quotations from the Bundesarchiv Berlin, Bildarchiv, 183-S93766. 14 cf. Fischer, Erinnerung, 2011, pp. 78–80; Fache, „Gegenwartsbewältigungen“, 2009, pp. 221–222. 15 cf. Matthias Neutzner, „Die Erzählung vom 13. Februar“, Dresdner Hefte, 23, 2005, 84, pp. 38–48. 16 Mention should be made here above all of the „Mahngang Täterspuren“ [city tour on the remembrance of the perpetators in Dresden] practiced since 2011, and Christine Pieper/Mike Schmeitzner/Gerhard Naser (ed. ), Braune Karrieren. Dresdner Täter und Akteure im Nationalsozialismus, Dresden: Sandstein, 2012; Uwe Fraunholz/Swen Steinberg/Stefan Beckert/Ulrike Marlow/Stefan Weise, [MIT]GEMACHT? Technik- und Naturwissenschaftler an der TH Dresden im Nationalsozialismus. Begleitband zur gleichnamigen studentischen Ausstellung in Dresden (Sächsische Landes-, Staats- und Universitätsbibliothek, DrePunct): 14. November 2012 bis 21. Januar 2014, Dresden: Sonderforschungsbereich 804, 2012. Cf. also footnote 6. 17 cf. Fischer, Erinnerung, 2011, p. 132. 18 Stein, Friedhöfe, 2000, pp. 148–149. Cf. also Deutsche Fotothek, df_ps_0003838. 19 quoted ibid., p. 149. See also Fache, „Gegenwartsbewältigungen“, 2009, p. 233; Fischer, Erinnerung, 2011, pp. 152–153, and the published results of the historians‘ commission set up in 2004, among other things to tackle the question of the death toll. Rolf-Dieter Müller/Nicole Schönherr/Thomas Widera (ed. ), Die Zerstörung Dresdens 13. bis 15. Februar 1945. Gutachten und Ergebnisse der Dresdner Historikerkommission zur Ermittlung der Opferzahlen (Berichte und Studien 58), Göttingen: V&R Unipress, 2010. 20 cf. . Stein, Friedhöfe, 2000, p. 149; Herbert Goldhammer/Karin Jeschke, Dresdner Gedenkorte für die Opfer des NS-Regimes, Dresden: ddp goldenbogen, 2006, pp. 22–25. 21 cf. Fischer, Erinnerung, 2011, p. 132; Herbert Goldhammer et al., Gedenkorte, 2006, p. 24. 22 cf. Fache, „Gegenwartsbewältigungen“, 2009, pp. 224–225. 23 cf., Friedhöfe, 2000, p. 149; Herbert Goldhammer et al., Gedenkorte, 2006, pp. 22–23. 24 cf. Fache, „Gegenwartsbewältigungen“, 2009, p. 224. 25 cf. Fischer, Erinnerung, 2011, p. 133. 26 Edgar Wolfrum, Geschichtspolitik in der Bundesrepublik Deutschland. Der Weg zur bundesrepublikanischen Erinnerung 1948–1990, Darmstadt: Wissenschaftliche Buchgesellschaft, p. 50. 27 In connection with 13 February Thomas Fache uses the appropriate general term Gegenwartsbewältigung [coming to terms with the present] cf. Fache, „Gegenwartsbewältigungen“, 2009. Cf. also Lars-Broder Keil, „Fiktion und Geschichtsbewusstsein. Wie Legenden und Mythen das Bild von vergangener Wirklichkeit beeinflussen können“, in: Sabine Horn/Michael Sauer (ed. ), Geschichte und Öffentlichkeit. Orte – Medien – Institutionen, Göttingen: Vandenhoeck & Ruprecht, 2009, pp. 32–39, here: pp. 36–37. 28 Fischer, Erinnerung, 2011, p. 133. 29 cf. Verena Haug/Gottfried Kößler, „Vom Tatort zur Bildungsstätte. Gedenkstätten und Gedenkstättenpädagogik“, in: Sabine Horn/Michael Sauer (ed. ), Geschichte und Öffentlichkeit. Orte – Medien – Institutionen, Göttingen: Vandenhoeck & Ruprecht, 2009, pp. 80–88, here: pp. 84–86. 30 cf. Wolfgang Benz, „Authentische Orte. Überlegungen zur Erinnerungskultur“, in: Petra Frank/Stefan Hördler (ed. ), Der Nationalsozialismus im Spiegel des öffentlichen Gedächtnisses. Formen und Aufarbeitung des Gedenkens, Berlin: Metropol, 2005, pp. 197–203. 31 cf. in spite of a marked over-emphasis on Christian contemplation see here the commentary on rites of burial indicating certain epochs, as well as the educational use of iconography on cemetaries Michael Wolf, Friedhofspädagogik. Eine Untersuchung im Kontext der Fragen nach erfülltem Leben, Tod und Ewigkeit, Wien/Berlin: Lit, 2011, pp. 125–126. 32 cf. Karl Heinrich Pohl, „Wann ist ein Museum „historisch korrekt“? „Offenes Geschichtsbild“, Kontroversität, Multiperspektivität und „Überwältigungsverbot“ als Grundprinzipien musealer Geschichtspräsentationen“, in: Olaf Hartung (ed. ), Museum und Geschichtskultur. Ästhetik – Politik – Wissenschaft (Sonderveröffentlichungen der Gesellschaft für Kieler Stadtgeschichte 52), Bielefeld: Verlag für Regionalgeschichte, 2006, pp. 273–286. Online available at www.zeithistorische-forschungen.de/Portals/_ZF/documents/pdf/Pohl-Museum.pdf [accessed 24.10.2012]. 33 cf. Neutzner, Erzählung. See also on local/civic identity and the role of 13 February, Gabriele B. Christmann, Dresdens Glanz, Stolz der Dresdner. Lokale Kommunikation, Stadtkultur und städtische Identität, Wiesbaden: Deutscher Universitäts-Verlag, 2004, pp. 260–270. 34 Stein, Friedhöfe, 2000, p. 145. 35 cf. www.lvz-online.de/nachrichten/mitteldeutschland/grabfeld-fuer-muslimische-gemeinde-auf-dem-dresdner-heidefriedhof-uebergeben/r-mitteldeutschland-a-131221-print.html [accessed 23.10.2014]. 36 cf. Swen Steinberg, „Ausstellungs-Rezension zu: Militärhistorisches Museum der Bundeswehr, Dresden Militärhistorisches Museum der Bundeswehr, Dresden“, H-Soz-u-Kult, 14.01.2012, hsozkult.geschichte.hu-berlin.de/rezensionen/id=152&type=rezausstellungen [accessed 26.10.2014]. 37 For the first time this criticism, expressed by the Jewish community not least because of the presence of the NPD in the Landtag [parliament] of Saxony, has borne fruit: in 2015 no further official commemoration will be held in the Heidefriedhof. It remains to be seen whether the choice of the Frauenkirche as a new central site will lead to a more critical treatment of the widespread victim narrative or not. The same is true of a future use of the Heidefriedhof. See “13. Februar: Bundespräsident Joachim Gauck soll Gedenkrede in Dresden halten [13 February: President of Germany Joachim Gauck to hold a speech of commemoration in Dresden], in: Dresdner Neueste Nachrichten, 10.11.2014. 38 The city of Dresden follows now suggestions the author made in 2013 in a German version of this article. Cf. “Lernort Heidefriedhof” [learning place Heidefriedhof], in: Landeshauptstadt Dresden (ed. ), Erinnerungsort, 2014, pp. 3-4; Swen Steinberg, „Nicht Gedenkort, sondern Lernort. Was der Heidefriedhof erzählt, und erzählen könnte“, in: Autor_innenkollektiv Dissonanz (ed. ), Gedenken abschaffen. Kritik am Diskurs zur Bombardierung Dresdens 1945, Berlin: Verbrecher Verlag, 2013, pp. 105-116.